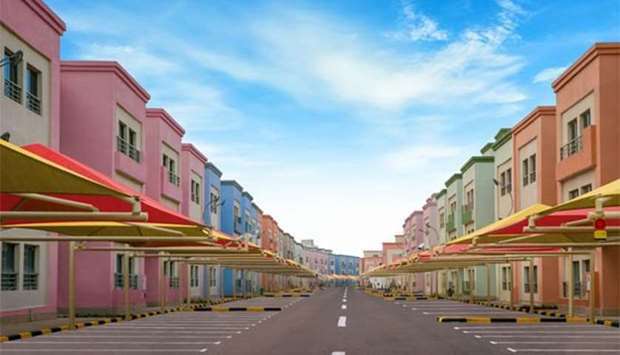 A view of the residential area of Ezdan Oasis. Ezdan Holding Group has announced that lease is now open for the first phase of ‘Ezdan Oasis’ in Al Wukair, the group’s largest real estate project spanning 1mn square metres with over 9,000 residential units. Lease is open for 1,875 fully-furnished housing units, ranging from one to two and three bedrooms, as well as 183 multipurpose commercial outlets “that will serve as the backbone of the city’s dwellers and residents of surrounding areas". “This will enable Al Wukair area to enter the comprehensive development course as it is becoming more popular and keen to provide diversified services. In addition, the state is working on laying a huge road network serving the region and the entire south of the country,” the statement said. Artist's rendition of Ezdan Oasis' aerial view. Ezdan Holding Group CEO Ali Mohamed al-Obaidli said: “Ezdan Oasis has expressively affected the market when it was first revealed hence the project came to be known as the ‘land of a million’ or the ‘one million project’. However, after long discussions, we have decided to name it Ezdan Oasis because it serves as an oasis in terms of services it provides for the neighbouring areas. Al-Obaidli added that he expects residents of Al Wukair and other surrounding areas to be attracted by the project as it includes many integrated services, including big mosques, hypermarkets, schools, and sports clubs, as well as “vital facilities” like multi-purpose commercial outlets. “Ezdan Holding Group has dedicated its extensive experience and tremendous efforts to the realisation of a project of this size, which offers such a wonderful package of services, fulfilling all needs of residents who will only leave the Oasis for work, since there are schools for children, shopping outlets, restaurants, supermarkets, hypermarket, sports courts, and more,” al-Obaidli said. He is also inviting all parties interested to lease, including residents and employees in the neighbouring areas, to visit Ezdan Oasis to learn more about the various services the project provides. Also, Newton British Academy has announced the opening of its first branch in Al Wakrah and Al Wukair. Its branch in Ezdan Oasis was opened to accommodate pre-primary to ninth grade students during the first academic year. Registration is open for the academic year 2017-2018. Grades 10 and 11 will be added during the 2018-2019 academic year.